Residents at Trillium and Rosewood retirement residences enjoyed a spectacular presentation by the descendant of a Titanic survivor. There was a bump in the night. Elizabeth Mellenger rose from her bed and looked out the porthole, trying to see if there was anything outside. 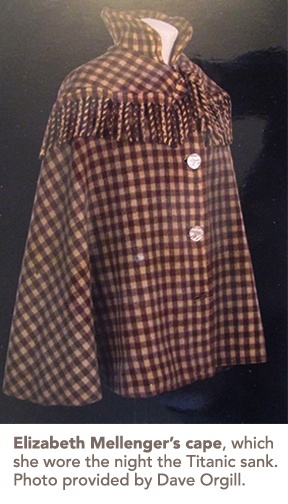 She was traveling on the RMS Titanic with her 13-year-old daughter, Madeleine, for a new job as the governess for the Colgate family in Bennington, Vermont. She couldn’t see anything, and so made her way back to bed. Madeleine had already completed her nightly ritual of looking at the lifejackets, neither of them could know how significant that ritual was about to become. “They knew something had happened,” said Don Mann, Elizabeth’s grandson. 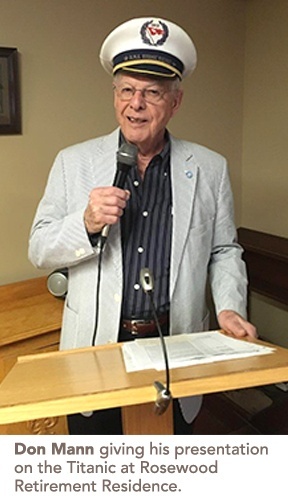 He recently gave a presentation at both Rosewood and Trillium retirement residences in Kingston about the Titanic and other sea disasters. Madeleine was immediately awake, and grabbed the life jackets. She and Elizabeth made their way up to the deck so quickly that Elizabeth was wearing only her nightgown and a woolen cape, having completely forgotten her shoes. On deck, everything was orderly and well organized. The passengers believed it was just a drill, since the Titanic couldn’t sink. They couldn’t see the iceberg at that time, but the trails of ice it had showered onto the Titanic’s deck as it scraped along the side of the iceberg were still there. The lifeboats were ordered to row away from the ship, because there was a fear the Titanic would create a whirlpool as it sank, sucking ships close to it underwater. The water was two degrees below freezing. Elizabeth and Madeleine’s lifeboat went back to look for survivors. In the early morning they found Second Officer Charles Lightoller, who was struggling to hang onto a capsized inflatable raft. Don thinks Lightoller must have stayed onboard the Titanic until the last minute. 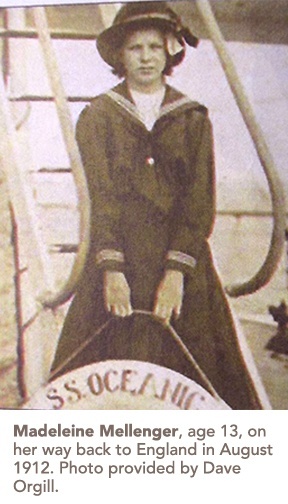 Lightoller was the most senior officer to survive the sinking. He went on to testify at two separate inquiries regarding the events of that night. It took 7 hours from the time the Titanic sank for the RMS Carpathia to arrive and begin rescuing survivors, according to Don. The Titanic had left Southampton with 2,200 passengers and crew, by the end of the night 1,500 were dead. Nearly half of all 2nd class passengers, like Elizabeth and Madeleine, died. There were only 700 survivors. The RMS Carpathia, meanwhile, had been on course to Austria-Hungary from New York, and according to Don it was at full capacity before taking on the Titanic survivors, making it a rather cozy journey back to New York. It was not until they were safely onboard Carpathia that Madeleine realized her mother, Elizabeth, had gone deaf from all of the pandemonium that took place during the Titanic’s sinking. Regardless, they met Mr. Colgate when they reached New York. In August of 2012, Elizabeth and Madeleine returned to England via ship, making a third trip back to North America, and this time Canada, in 1913 with the rest of the family, where they settled permanently. Madeleine met Don’s father, David Daniel Mann at a printing company called Bryant Press. They were married in 1921, and welcomed their two sons soon after, and then Madeleine got sick. It took nearly 10 years for Madeleine to recover, and even then, her doctors told her she shouldn’t have any more children. “I wouldn't be talking to you if she had listened to her doctor,” Don said. He was born in 1933, and has one younger brother. Don was about two when he first learned of his mother’s journey on the Titanic. He said it was always in the house, and that she was often on talk shows and radio shows. He has a story she wrote about her experience, and her original notes. The ship cost an estimated $7.5 million to build in 1912, which would be over $400 million today, according to CNN. It was the largest ship afloat at the time. Despite his love of the topic, Don has never seen the movie Titanic. Today, Madeleine is survived by 10 grandchildren. Special thanks to Don Mann, who resides in Kingston, Ontario, for sharing his family’s story.